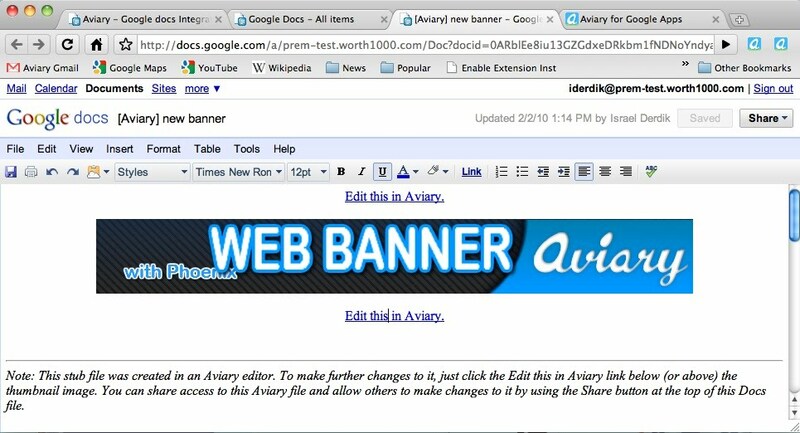 Users could retrieve Google Docs files within the Aviary editors once they were launched (via the DocList API). 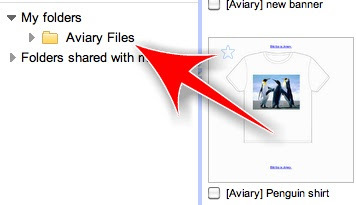 However, Aviary found that although saving the files to Docs was easy, there was no way to associate an Aviary editor to a specific file type (i.e. jpg) and make it launch Aviary's editors directly from inside Google's interface. Aviary wanted a way to make the experience truly seamless for Google's users. Having separate areas to manage Aviary files and Google Docs was a less than ideal user experience. Add in the fact that many more third party apps will be launching in Google's marketplace and the end result would be an organizational nightmare for users trying to remember where all of their files were stored. Keeping things in one universal interface was imperative, but there was no native API for that yet. So to protect the user experience in the interim, Aviary needed to come up with a novel work around. Fortunately, there was a simple and elegant way. Because Google does allow creating new native Documents using the DocumentService.Insert method of the DocList API, Aviary was able to create "stub documents" with private references to the actual Aviary document inside of them. Each stub document contains a thumbnail of the final image and a private (but shareable) URL that launches the Aviary editor with the original editable Aviary ".egg" file inside of it (".egg" is our native file format - it seemed apropos for Aviary). Another benefit of this approach is that it allows Aviary to work with Google Apps Standard accounts which ordinarily do not allow the uploading of arbitrary custom file types, (unlike the Google Apps Premier accounts which do). Best of all, routing the file through Google Docs means that managing permissions on who can edit and see the document is as simple as managing permissions on any Google Document. Aviary didn't need to reinvent the wheel. Aviary is a suite of design applications that are mostly design oriented although they do have audio editing capabilities as well. This means that most files created in Aviary are visual in nature. Browsing through a list of file names when looking for a visual file can be inefficient - but just by sticking with some of Google's native functionality worked well. Google's Docs list has a little-known Grid view button, which displays Google Docs using a grid of thumbnails. Grid view gives the user a visual thumbnail preview of the contents of their Google Docs - including the stub documents we made. Perfect for finding Aviary files! To make things simpler to find and organize, all of the stub files are in an Aviary folder by default. To facilitate file and folder management, Aviary wrapped the Gdata classes provided by Google with an Aviary helper class that provided all of the functionality needed to create folders, upload and replace files. Within this class, Aviary used the DocumentService.Insert method of the DocList API to add an AtomEntry with a category of "folder" to create this base folder. One additional thing Aviary did was to automatically create a Help File in a user's Google Docs list the very first time an Apps user clicks on the Aviary link in Google's universal navigation. This help file contains an overview of the different Aviary editors that are available and some tips on how to use them. Aviary used the same DocumentService.Insert method of the DocList API to create this help document that was used to create the stub documents. Aviary sends the user a one-time summary email with the contents of this help file to make sure they can find the answers they need in the future. When put all together, we now have a workable application that integrates smoothly with Google apps, giving all Apps users complete access to Aviary's multimedia editing suite. The more developers build on Google's Apps platform, the more useful it is to users, and the more everyone's apps are used as a result. Editor's Note: This post was written by Avi Muchnick, CEO of Aviary, and edited by Don Dodge of Google. We invited Aviary to share their experiences integrating their app with Google Apps. Aviary is a multimedia editing suite that lets people edit and retouch images, create logos, markup screen shots and even edit audio. 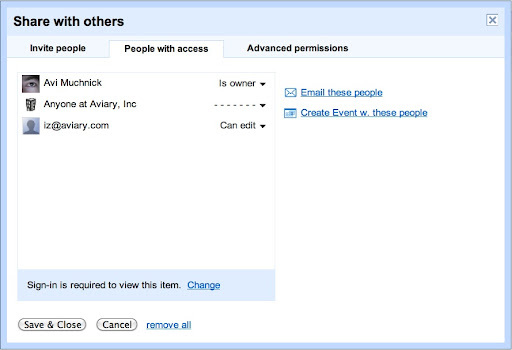 Aviary is available on the Google Apps Marketplace, and can be accessed right from the Google Apps navigation bar. 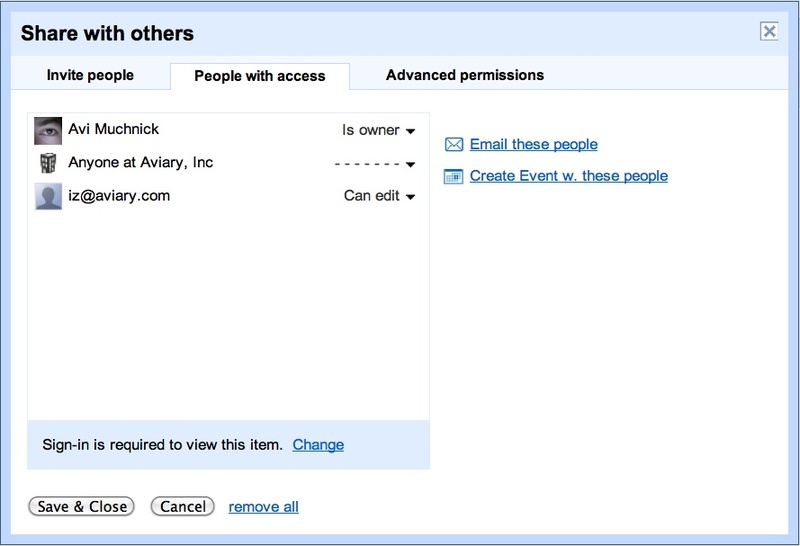 One of the feature Aviary built as part of this integration with Google Apps was letting users save their Aviary creations to their Google Docs account. Integrating Aviary's suite of editors and their associated files into Google Docs was a terrific challenge for the team. Google provided Aviary with a great initial set of APIs to let Google Apps users navigate to and launch Aviary from within their universal navigation.